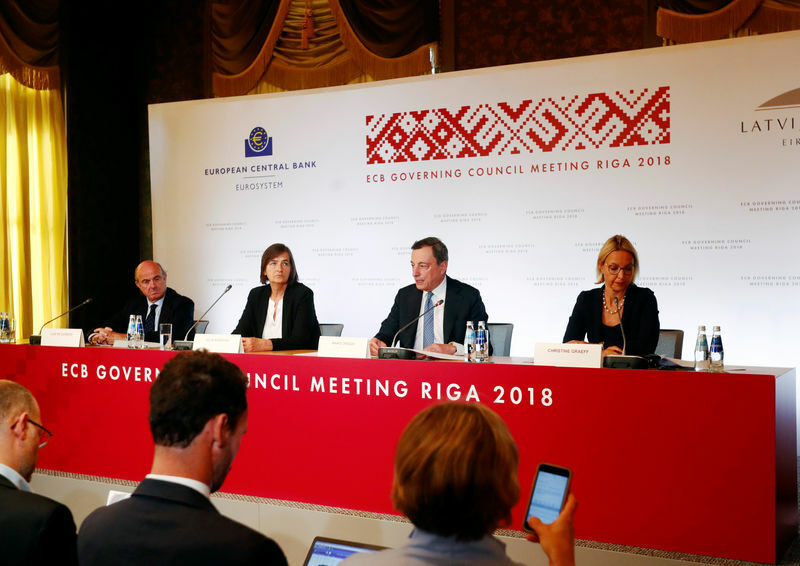 RIGA/FRANKFURT (Reuters) – The European Central Bank will shut its hallmark bond purchase scheme by the close of the year, it said on Thursday, taking its biggest step yet toward dismantling crisis-era stimulus a decade after the start of the euro zone’s economic downturn. But in a balanced announcement reflecting the uncertainties hanging over the economy, it signaled that any interest rate hike is still distant, raising the prospect that ECB chief Mario Draghi might leave office in October 2019 without having raised rates in his eight-year term. The timid move to roll back stimulus contrasted with the U.S. Federal Reserve’s rate hike a day earlier, which signaled a break from policies used to battle the 2007-2009 financial crisis and a return to normalized central banking. The new rates guidance sent the euro down over one percent against the dollar to $1.1644 (EUR=EBS) and pushed bets by investors on the timing of a first deposit rate increase back by three months to September 2019. “While yesterday’s Fed hike was very much ‘hawkish’, in our view, the ECB opted to announce the end of its net asset purchases with a dovish flavor,” BNP economist Luigi Speranza said. The ECB will halve its bond buys to 15 billion euros a month from October then shut the program at the end of the year. It also sees interest rates steady “at least through the summer of 2019” — a vague definition that gives policymakers a wide window and the flexibility to push back any move. Adding a surprisingly dovish tinge to the decision, Draghi emphasized that uncertainty and risks were increasing, comments taken to indicate that risks were skewed toward a later hike, rather than an earlier move. “This decision has been taken in the presence of a strong economy with increasing uncertainty,” he said of a political landscape characterized notably by rising trade tensions between the United States, Europe and China. Highlighting the risks to the outlook, the ECB downgraded its euro zone growth forecast for this year to 2.1 percent from 2.4 percent previously, while upgrading its inflation forecast to 1.7 percent from 1.4 percent, largely as a result of rising oil prices. By putting a specific end-date on its stimulus, the ECB is nevertheless taking a more decisive step than the Fed did when it started its own taper in December 2013 without committing to a specific end or any subsequent steps. For the ECB, the biggest complication could be a murky economic outlook, muddied by the developing trade war, a populist challenge from Italy’s new government and softening export demand. Draghi, a former Italian central bank governor, downplayed Italy’s turbulence as “a pretty local episode”, arguing that government policy shifts are normal market events. But a broader slowdown could make it harder for the ECB to cut support if lower growth eases pressure on inflation, a threat to the bank’s credibility as it has missed its inflation target of almost 2 percent for over five years. The euro’s more than 6 percent fall against the dollar since April is helping the ECB as the weaker currency is increasing the cost of imports and boosting inflation. While a rebound is likely, the Fed’s tightening stance will limit the potential for a big rise in the euro. Projections for underlying inflation — excluding volatile food and energy prices — barely moved in the bank’s new forecasts, however, rising only 0.1 percentage point for next year and 2020. “The end of net purchases does not mark the end of very loose policy. In fact, Draghi sounded dovish today, and we still expect the first rate hike only in December 2019,” Nordea economist Jan von Gerich said.